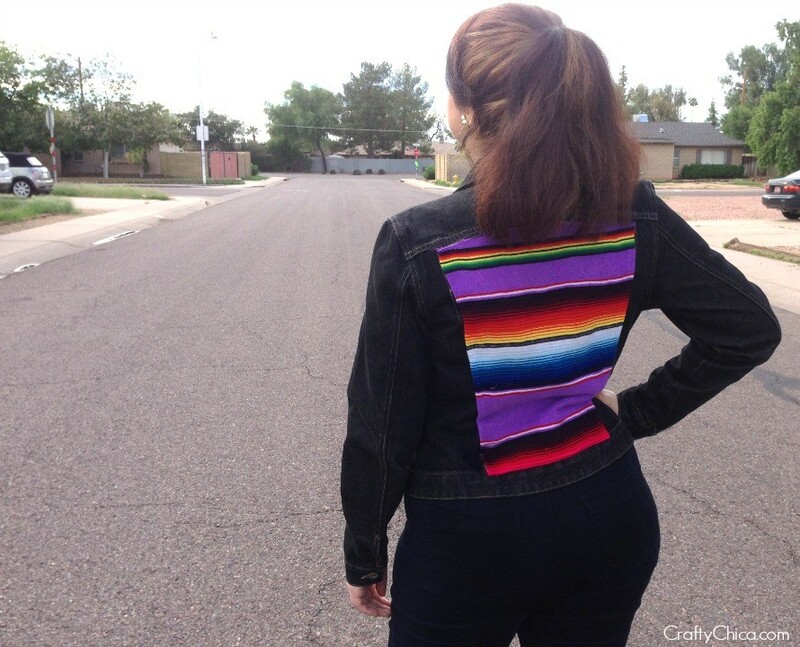 The fall temperatures are finally, slowly, rolling in, and that means – denim jacket DIY time! For this week’s Savers #FindTheFind post, a that was my point of focus. 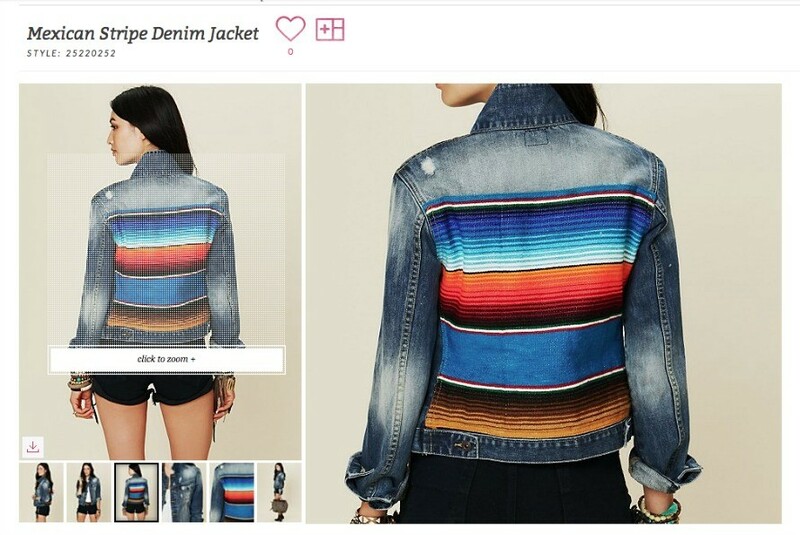 See, I’d read a blog post by my friend, Ana Flores about Latin-inspired fashion and fell in L-O-V-E with this Mexican Stripe Jacket from FreePeople. 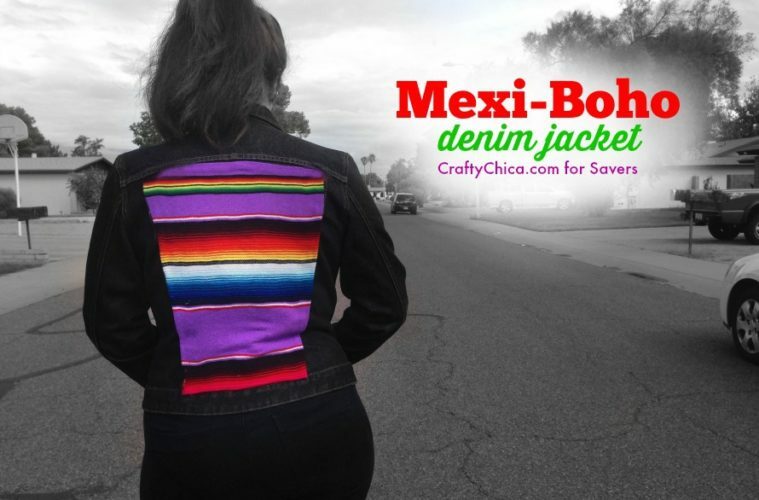 I love this jacket, but at $150, I’ll make my own! 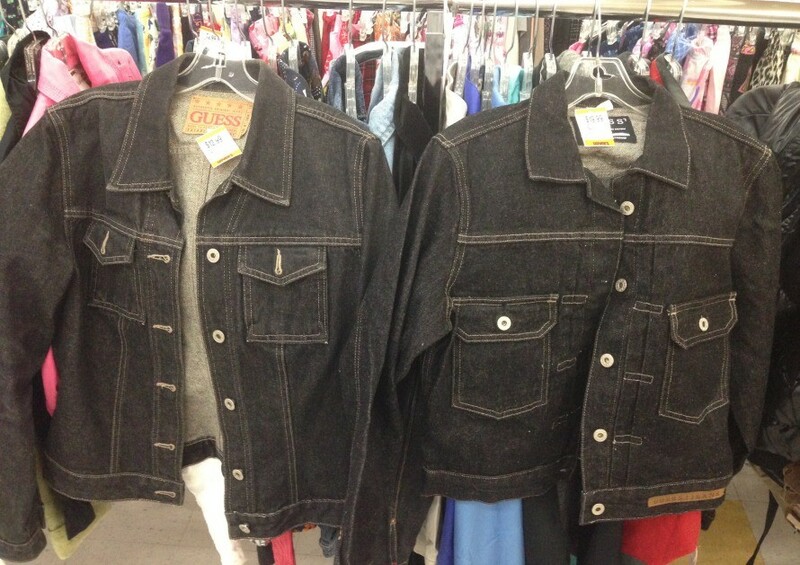 The first step was to visit Savers to find a denim jacket. Easy. 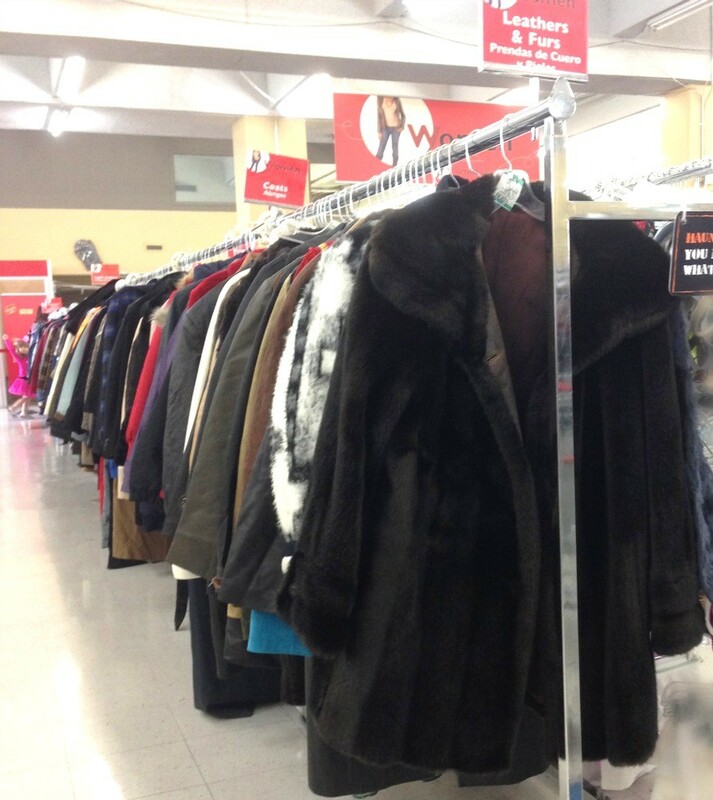 Geez, Savers has a huge selection of jackets and coats for every personality. Seriously…I came across high quality vintage faux fur capes, trench coats, and everything in between, all neatly sorted and sectioned by size. I took Maya with me and she bought two vintage pea-coats in mint condition. That’s why everyone loves Savers, it’s a thrift store that has the selection and layout of a department store where you can find a mix of vintage pieces and brand names all for great prices. I finally found several denim jackets, it was hard to choose! These were the final two, both were Guess brand and in perfect shape. I went with the one on the left in the image below. 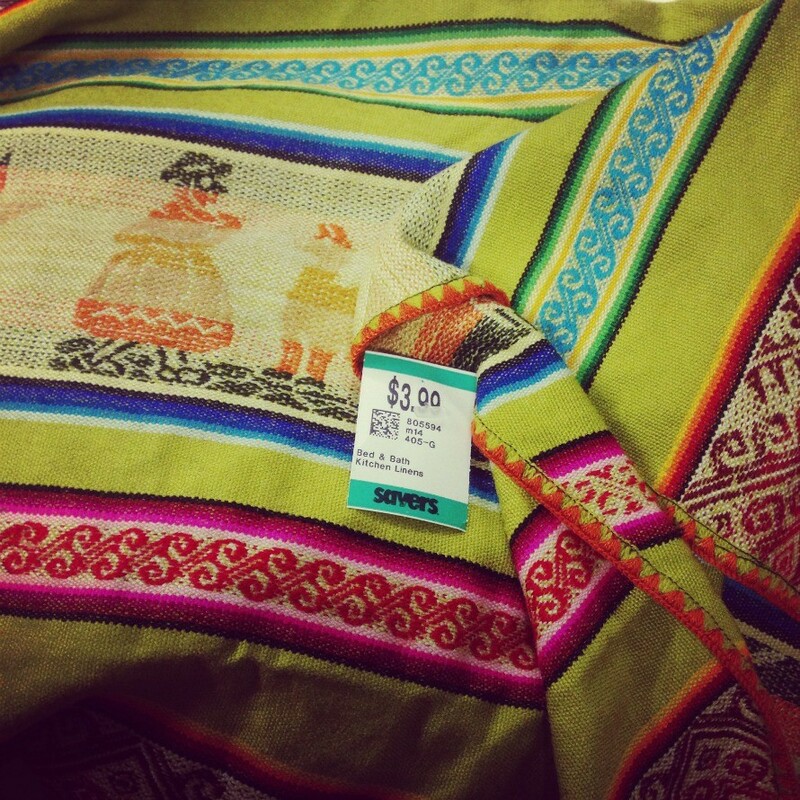 As far as the blanket to cut up to put on the back of the jacket, I searched the bedding department and found this Mexican tablecloth. 1. Tape sheets of tracing paper together to fit the back of the jacket area you want to cover. 2. 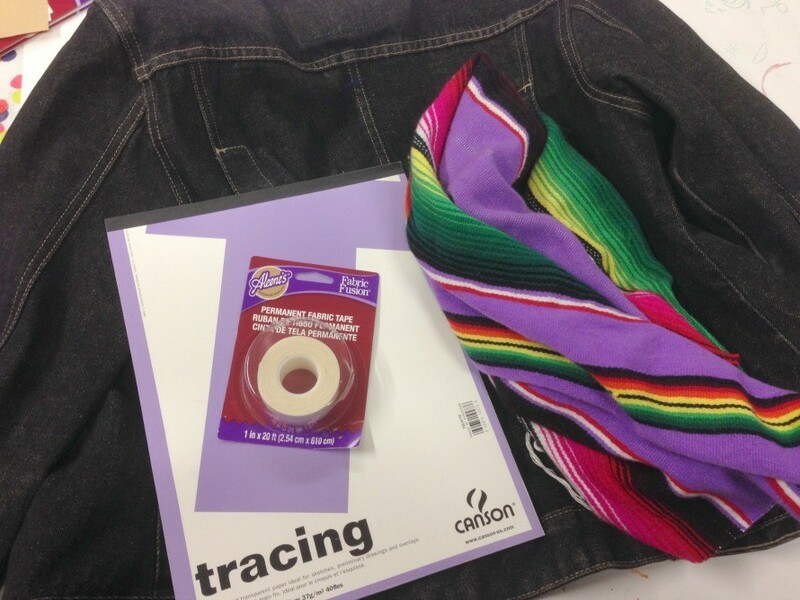 Use the pencil to draw the outline based on the outer stitched edge. 3. Cut out the tracing paper shape and pin to the fabric. 4. Cut about 1/2 an inch away from the edge of the paper. 5. 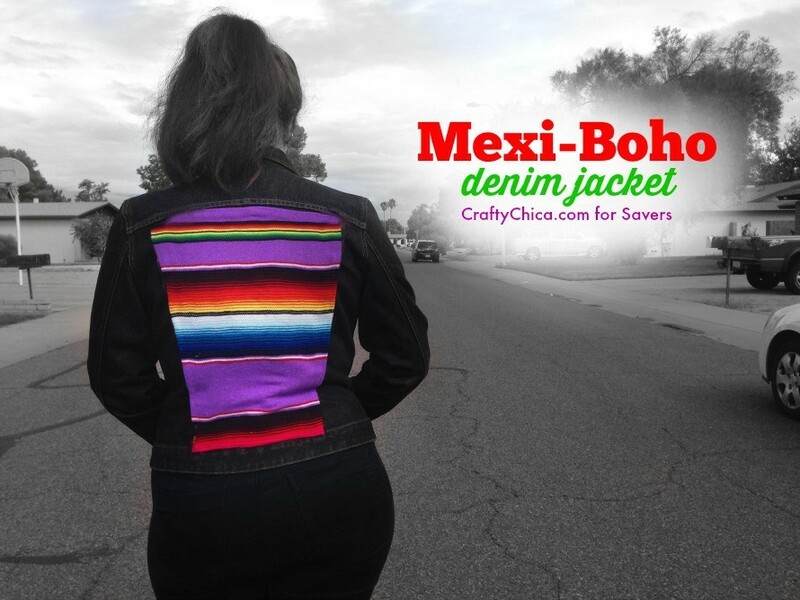 Hem the edges with skinny adhesive tape, or sew with machine. 6. Apply thicker tape around the edges of the piece. 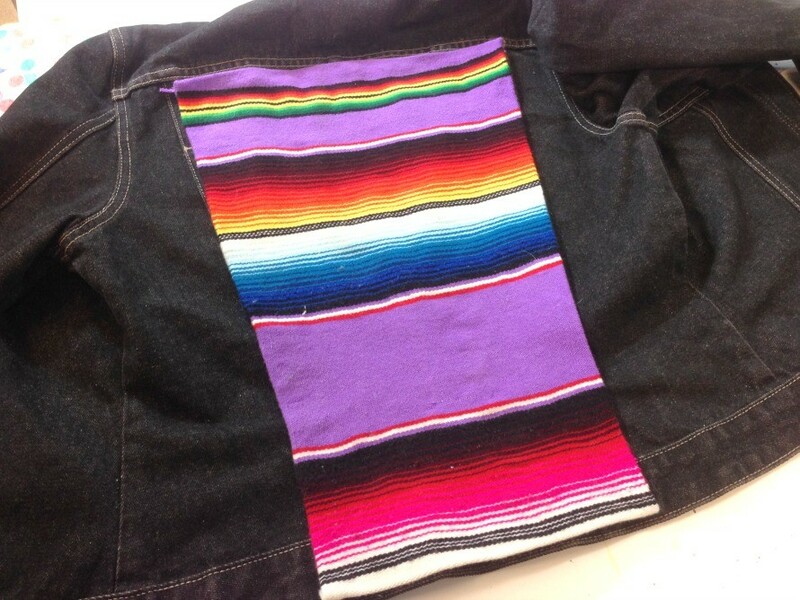 Peel off the backing from the tape and press the fabric sheet in place on the jacket. 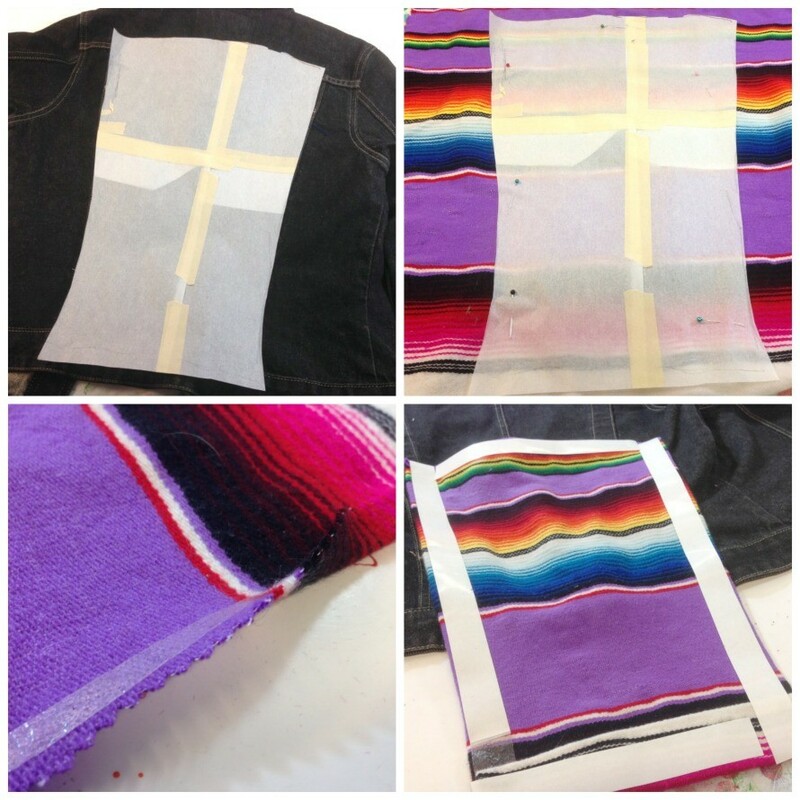 If you don’t want to use fabric tape, you can hand stitch or use liquid glue. And there you have it! The permanent fabric tape will hold, but if you wash it, because the blanket is so thick, you may have to reapply fresh strips of tape. What I also like about using the tape is that I can always switch out the fabric if I want! See how easy that was? 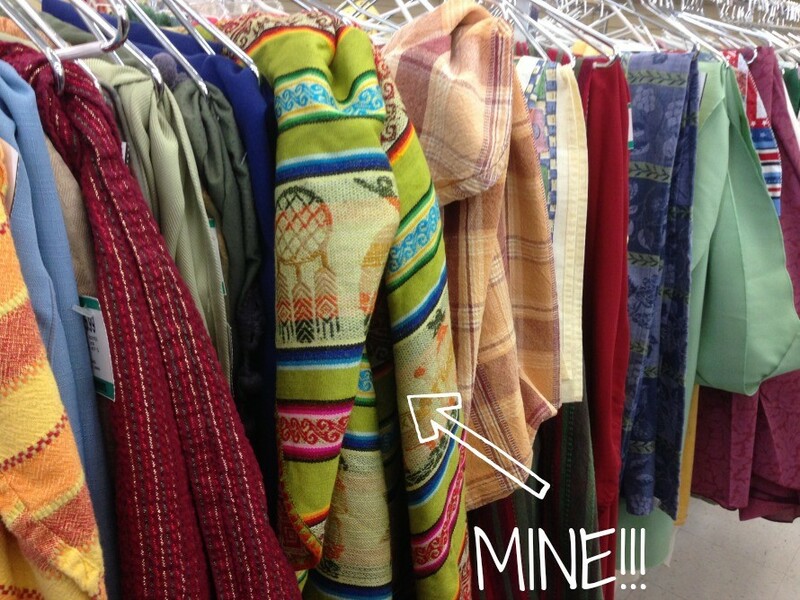 Don’t you want to visit Savers to find a cool coat…or a tablecloth? Visit Savers.com to sign up for the Super Savers Club, to learn about careers, donating, and more!